Rabbits eat carrots, right? 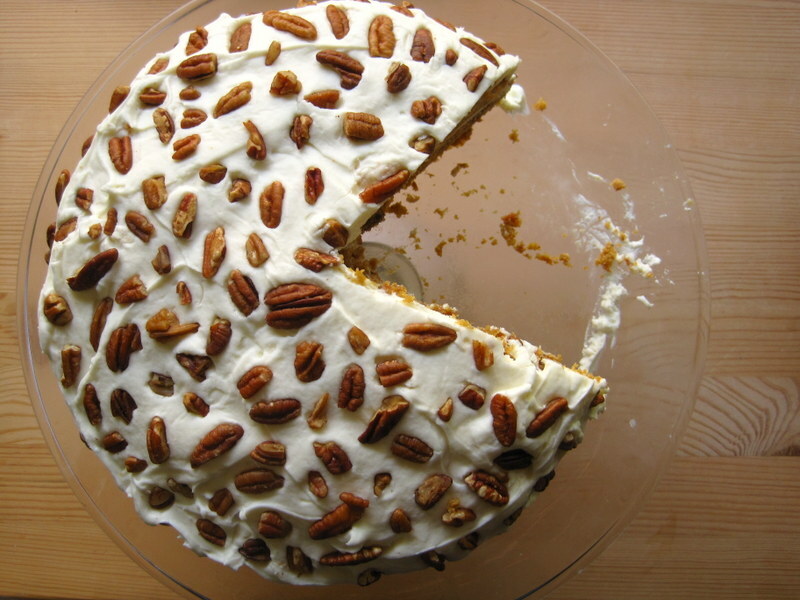 That was my rationale for making this cake for Easter. 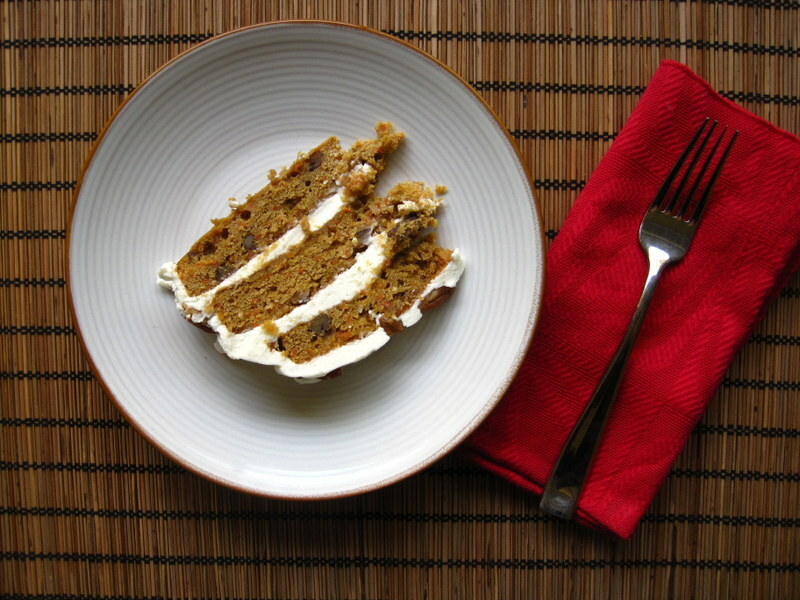 I didn’t need much of a reason, really, except that I love carrot cake, and I have a willing guinea pig to try everything I bake. I must say, this was the most successful layer cake I’ve ever made (and assembled), and my first triple-layer cake. I attribute my victory entirely to these invaluable tips given by Deb at Smitten Kitchen. The most important part: bake at 300 instead of 350 for a flatter cake. Brilliant! It takes 15 minutes longer in the oven, but it is totally worth it when you are trying to get layers to sit neatly in a stack. And you can dispense with all that messy hump-trimming that is otherwise necessary (and which has made every other layer cake I’ve put together more of an…earthquake cake). The other secret: refrigeration! Much easier to work with cold cakes and cold frosting. Also, much nicer slicing action. But on to the rest of this undertaking! Just look at these nice stripes of frosting! Incidentally, this is largest size piece I recommend. It is decadent! I ate a big piece for breakfast this morning…and was not hungry again until 5:30pm. Something about that suggests…that I should eat smaller pieces! The cake itself is perfectly spiced and moist. It reminds me of the cakes I used to ask for when I was a kid for my birthday. I always wanted spice cake! I was on a Bundt kick for a long time because I am not really the hugest fan of frosting…but I am starting to come to terms with it. When done right, it can be really wonderful. This cream cheese frosting is pretty much everything you could hope for. BUT. I would recommend cutting the recipe in half unless you really are more of a frosting person than a cake person. I put *so* much frosting on this cake, and I still have some leftover in the freezer. 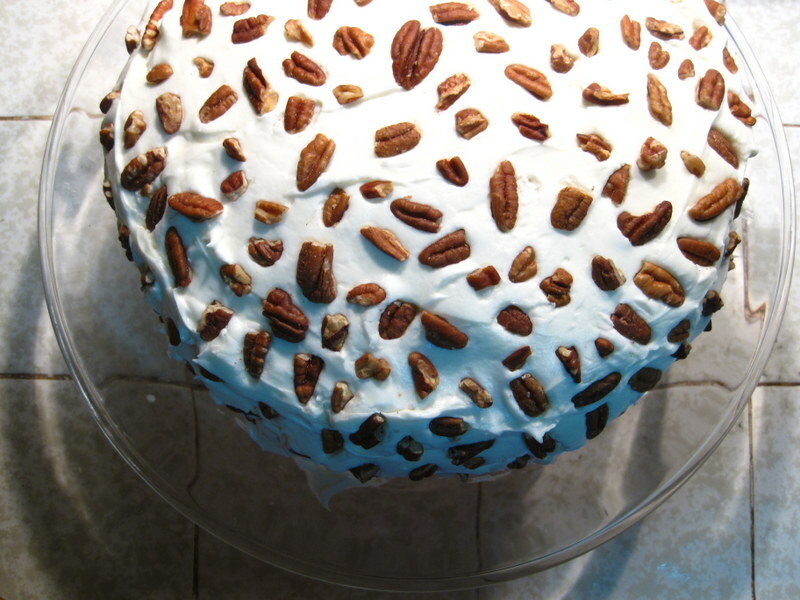 And, of course, since I can’t live without crunch, I covered the whole thing in pecans. Beautiful! And here is my cake preening itself in front of a few ginger beers, some sugar snap peas, and the last dregs of my shallot salad dressing. A lovely sight. I am pretty sure that most of this cake will be in the freezer from now until Christmas…so come on by and try some! -Make the cake: Preheat oven to 350 degrees. (Or 300 if you plan to bake them at a lower temperature). Butter three 9-inch round cake pans. Line bottoms with parchment paper, and butter parchment. Dust with flour, tapping out excess. Whisk together flour, baking powder, baking soda, cinnamon, salt, ginger, and nutmeg. -Beat butter and sugars with a mixer on medium speed until pale and fluffy. Add eggs, one at a time, beating well after each addition. Beat 3 minutes. 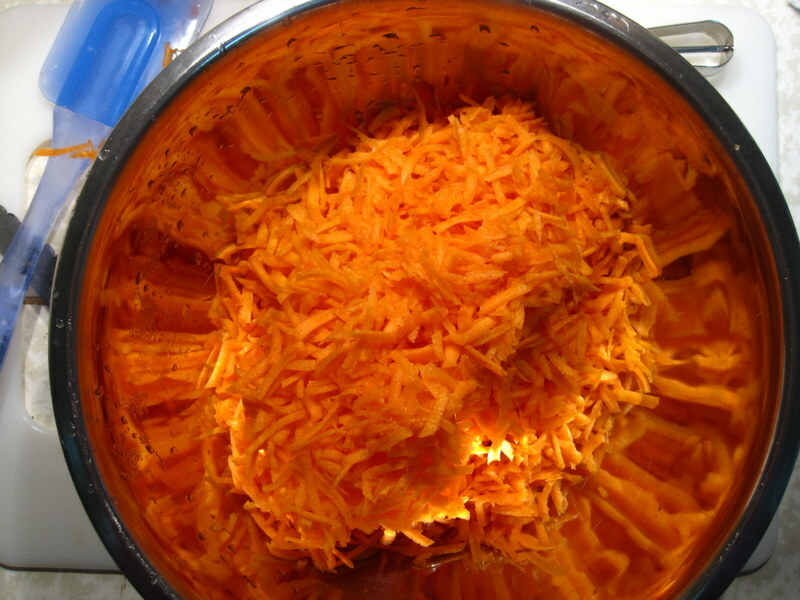 Add vanilla, water, and carrots. Beat until well combined, about 2 minutes. Reduce speed to low, and add flour mixture, then finely chopped pecans. -Scrape batter into prepared pans, dividing evenly. Bake, rotating pans halfway through, until golden brown and a toothpick inserted into centers comes out clean, about 30 minutes. (Bake 45 minutes if baking at 300 instead of 350). Let cool in pans on a wire rack for 15 minutes. Run a knife around edges of cakes to loosen, and turn out cakes onto rack. Turn right side up, and let cool completely. -Make the frosting: In the bowl of an electric mixer, beat cream cheese and vanilla until light and creamy, about 2 minutes. With mixer on medium speed, gradually add butter, beating until incorporated. Reduce mixer speed to low. Gradually add sugar, beating until incorporated. -Using a serrated knife, trim rounded top of 2 cakes. Place one trimmed cake, cut side up, on a serving platter. Spread 1 cup frosting over cake. 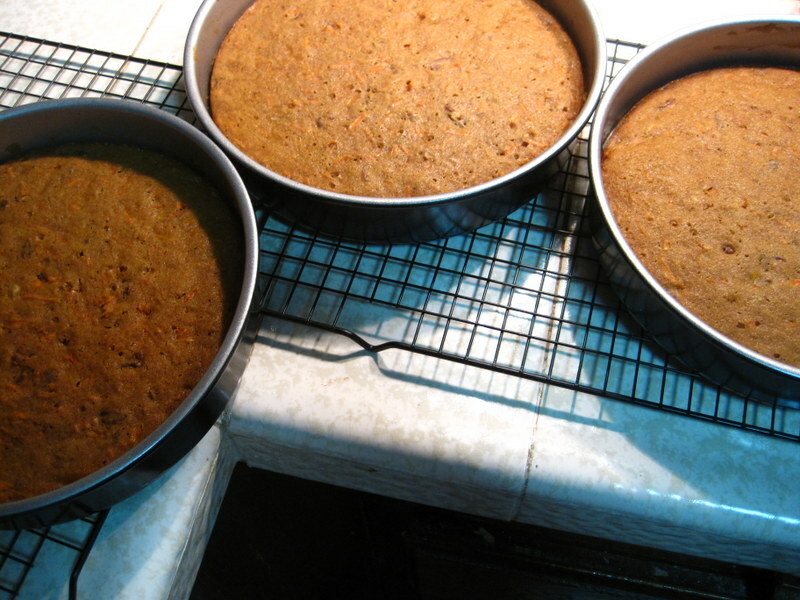 Top with second trimmed cake, cut side down. Spread 1 cup frosting over cake. Top with remaining cake. Spread remaining frosting over top and sides. 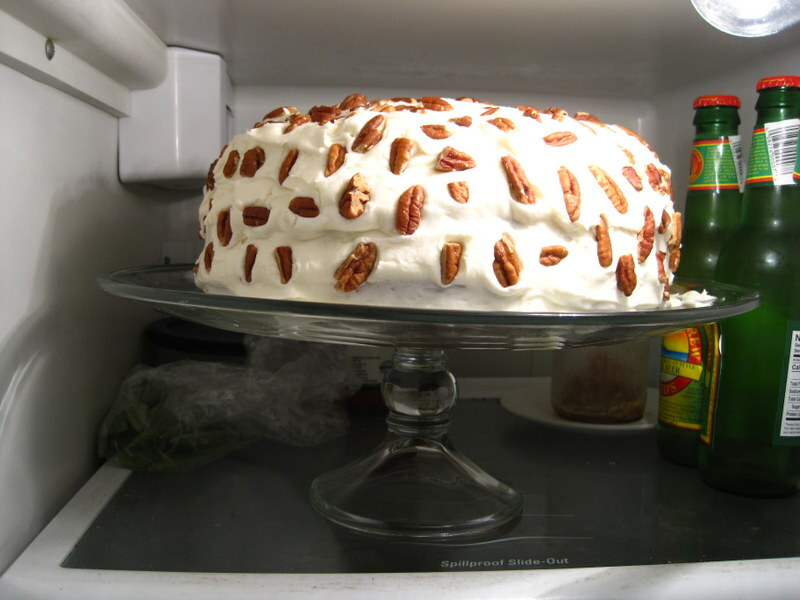 Gently press coarsely chopped pecans onto sides of cake. Refrigerate 1 hour before serving. Yum! This cake looks like the most delicious dessert — or breakfast, or snack with a ginger beer, for that matter! 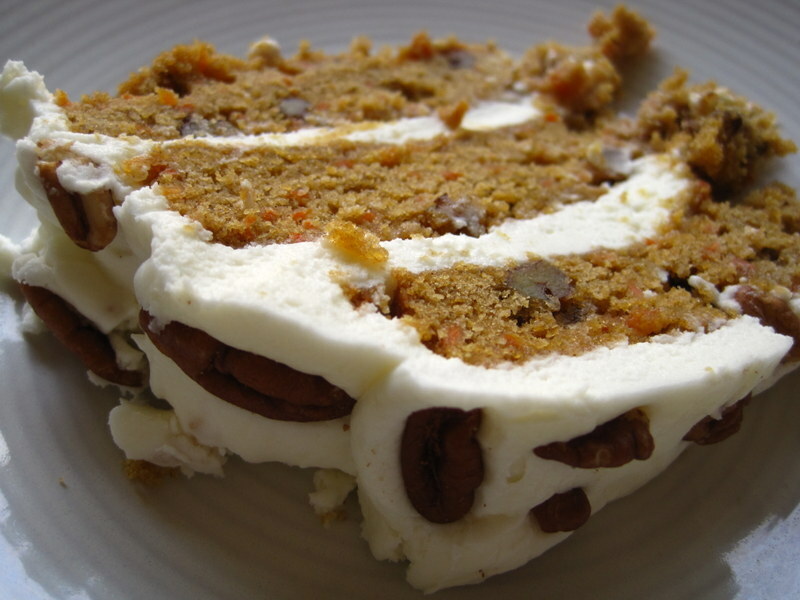 Carrot cake with cream cheese frosting is the best. I say there is no shame in having become a cake obsessive, and I just love picturing you and Eric plotting your favorite desserts against their childhood frequency for you. What fun! I hadn’t thought of it, but, yes! It would be perfect with ginger beer! I must say, you have totally been my cake inspiration–the things you bake are so beautiful! When I saw your rainbow layer birthday cake, I was just in awe. You give me hope that it can be done! That looks SO yummy! It’s been my experience also that most icing amounts are overly generous! (Anymore, I just scoop off the icing–it leaves a thin glaze that seems just right for me!) Kudos on a gorgeous Easter cake! Thank you! That sounds like a great idea with the frosting–a glaze is much more my style! I think one batch of frosting could get me through about 5 cakes, but maybe it’s not a bad thing to have in the freezer, for when the cupcake mood strikes:) In happy news, I took a big hunk to my book club tonight, and they all really liked it. Success! 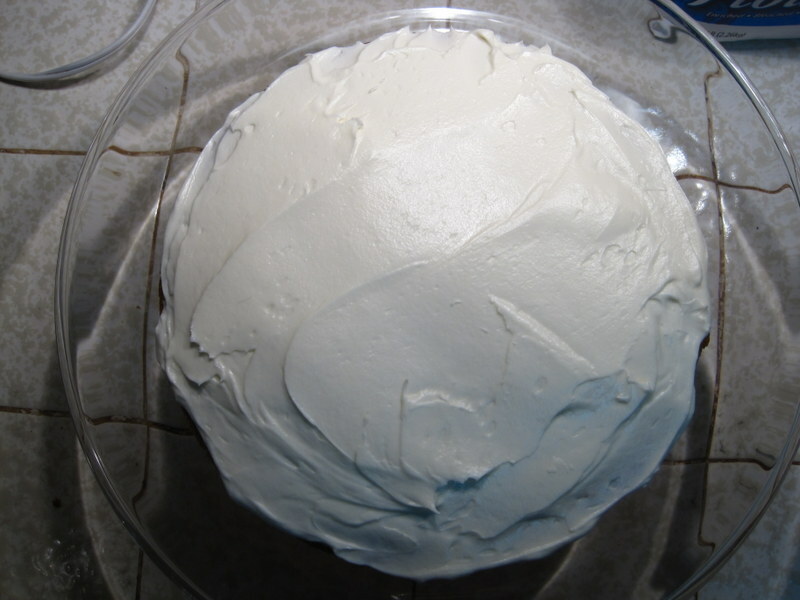 And I don’t always find myself to be so much of a frosting person either; I think the cake is the real prize…that being said, I do, however, have a weakness for cream cheese frosting, which is infinitely better than buttercream. P.S. Don’t eat smaller pieces of cake. I love that P.S.! 🙂 I love love love carrot cake, but I was thinking maybe next time I could try a Bundt with just a light glaze? It would be a nice counterpoint to this behemoth! I am with you on the frosting–I say give me chocolate or cream cheese or give me death! Or maybe just give me more cake. That’s also a good option.